Before any immune mechanism can go into action, there must be a recognition that something exists for it to act against. Normally this means foreign material such as a virus, bacterium or other infectious organism. This recognition is carried out by a series of recognition molecules or receptors. Some of these circulate freely in blood or body fluids, others are fixed to the membranes of various cells or reside inside the cell cytoplasm. In every case, some constituent of the foreign material must interact with the recognition molecule like a key fitting into the right lock. This initial act of recognition opens the door that leads eventually to a full immune response. These receptors are quite different in the innate and the adaptive immune system. The innate system possesses a limited number, known as pattern-recognition receptors (PRRs), which have been selected during evolution to recognize structures common to groups of disease causing organisms such as the lipopolysaccharide (LPS) in some bacterial cell walls. These PRRs act as the ‘early warning’ system of immunity, triggering a rapid inflammatory response which precedes and is essential for a subsequent adaptive response. In contrast, the adaptive system has thousands of millions of different receptors on its B and T lymphocytes, each one exquisitely sensitive to one individual molecular structure. The responses triggered by these receptors offer more effective protection against infection, but are usually much slower to develop. Linking the two systems are the families of major histocompatibility complex (MHC) molecules, specialized for ‘serving up’ foreign molecules to T lymphocytes. Another set of ‘linking’ receptors are those by which molecules such as antibody and complement become bound to cells, where they can themselves act as receptors. Figure 1. 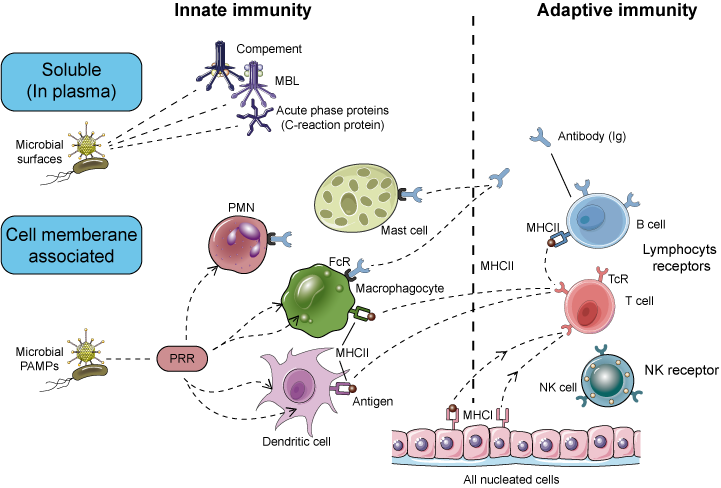 The immune recognition and receptors in innate and adaptive immunity. The innate immune system recognizes molecular structures that are produced by microbial pathogens. The microbial substances that stimulate innate immunity are often shared by classes of microbes and are called pathogen-associated molecular patterns (PAMPs). Different types of microbes express different PAMPs. These structures include: nucleic acids that are unique to microbes, such as double stranded RNA found in replicating viruses and unmethylated CpG DNA sequences found in bacteria; features of proteins that are found in microbes, such as initiation by N-formylmethionine, which is typical of bacterial proteins; and complex lipids and carbohydrates that are synthesized by microbes but not by mammalian cells, such as lipopolysaccharide (LPS) in gram-negative bacteria, lipoteichoic acid in gram-positive bacteria, and oligosaccharides with terminal mannose residues found in microbial but not in mammalian glycoproteins (Table 1). Whereas the innate immune system has evolved to recognize only a limited number of molecules that are unique to microbes, the adaptive immune system is capable of recognizing many more diverse foreign substances whether or not they are products of microbes. Figure 2. Cellular locations of pattern recognition receptors of the innate immune system. 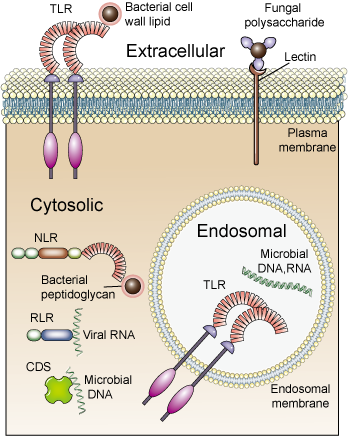 Toll-Like Receptors: Toll-like receptors (TLRs) are an evolutionarily conserved family of pattern recognition receptors expressed on many cell types that recognize products of a wide variety of microbes as well as molecules expressed or released by stressed and dying cells. The TLRs are type I integral membrane glycoproteins that contain leucine-rich repeats flanked by characteristic cysteine-rich motifs in their extracellular regions, which are involved in ligand binding, and a Toll/IL-1 receptor (TIR) homology domain in their cytoplasmic tails, which is essential for signaling. TIR domains are also found in the cytoplasmic tails of the receptors for the cytokines IL-1 and IL-18, and similar signaling pathways are engaged by TLRs, IL-1, and IL-18. NOD-Like Receptors: NOD-like receptors (NLRs) are a family of more than 20 different cytosolic proteins, some of which recognize PAMPs and recruit other proteins to form signaling complexes that promote inflammation. This family of proteins is named after NOD (nucleotide oligomerization domain–containing protein). Typical NLR proteins contain at least three different domains with distinct structures and functions. These include a leucine-rich repeat domain that senses the presence of ligand, similar to the leucine-rich repeats of TLRs; a NACHT (neuronal apoptosis inhibitory protein [NAIP], CIITA, HET-E, and TP1) domain, which allows NLRs to bind to one another and form oligomers; and an effector domain, which recruits other proteins to form signaling complexes. The NLRP subfamily of NOD-like receptors respond to cytosolic PAMPs by forming signaling complexes called inflammasomes, which generate active forms of the inflammatory cytokines IL-1 and IL-18. RIG-Like Receptors: RIG-like receptors (RLRs) are cytosolic sensors of viral RNA that respond to viral nucleic acids by inducing the production of the antiviral type I interferons. RLRs can recognize double-stranded RNA and RNA-DNA heteroduplexes, which include the genomes of RNA viruses and RNA transcripts of RNA and DNA viruses. The two best characterized RLRs are RIG-I (retinoic acid–inducible gene I) and MDA5 (melanoma differentiation-associated gene 5). Both of these proteins contain two N-terminal caspase recruitment domains that interact with other signaling proteins, an RNA-helicase domain, and a C-terminal domain, the latter two being involved in RNA recognition.